Knit, crochet or sew - your choice! 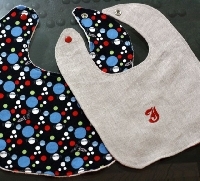 You will make a baby bib for one partner in this swap. I have listed some free pattern resources on my blog to spark your creativity. I encourage people to go visit their partner's website, profile, Flickr pages, etc to see if they can get a sense of their partner's preferences. If you have specific preferences for your own bib, please post them in the comments below. I would love to see pictures of the finished bibs, so I will set up a Flickr group once partners have been assigned. You can also upload a picture to this swap's page here on Swap-bot (I think). This swap is open to newbies with a fully completed profile. If you have already participated in one or more swaps, you must have a rating of 4.9 or above and no no-sends in the last two months. I will angel if needed, but I hope it will not be necessary. To my partner: I absolutely LOVE and in NEED for bandana bibs!! I have a 5 months old girl. If my partner wants to make one I can always send her the pattern I have made myself that I use (to be able to either sew it like that or remake it). i would love a sewn bib, as i have knitted quite a few for my little-one-to-be. what a wonderful swap! No style preference for me, but it needs to be for a baby girl - my first grandniece is arriving at the end of July!